NAV-X Credit Card has several automated processes that run in the background. You can find those processes already configured in the job queue. 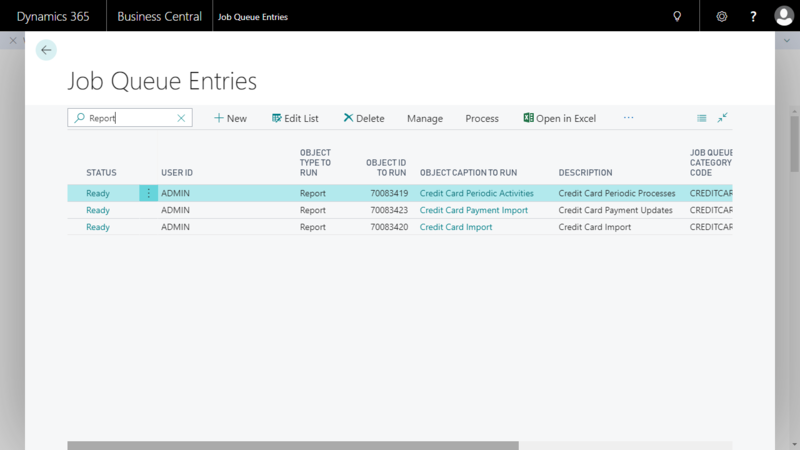 The job queue can be accessed by searching for “Job Queue Entries” in the search box of Microsoft Dynamics 365 Business Central. You typically do not have to make any changes to those processes, but you should be aware that they are there and that they might need periodic review. If the “Status” of any of the job queue entries for NAV-X Credit Card ever shows the status of “Error”, you can select the action “Show Error” to display the error message for this entry and take corrective action, such as resolving the error and then using the action “Set Status to Ready”. You can also change the frequency of the processes or the dates and times they are running. The periodic activities reauthorize expiring credit card authorizations automatically, delete sensitive data from processes transactions, review credit cards for their expiration dates and block them, and also remove blocked, unused, and expired credit cards. Customers can enter their credit card information through the EBizCharge Connect portal. This process imports these credit cards from the portal into Microsoft Dynamics 365 Business Central. Any payments that have been processes outside of Business Central, such as payments that came in from the portal, are imported into Business Central with this process. Once imported, the payments are automatically posted as payments in Business Central and, if possible, applied to the proper invoices.